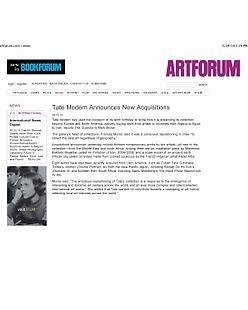 Tate Modem has used the occasion of its tenth birthday to show how it is expanding its collection beyond Europe and North America, actively buying work from artists in countries from Algeria to Egypt to Iran, reports The Guardian's Mark Brown. The gallery's head of collections, Frances Morris, said it was a conscious repositioning in order "to collect the best art regardless of geography." Acquisitions announced yesterday include thirteen contemporary works by ten artists-all new to the collection-from the Middle East and north Africa. Among them are an installation piece by Mahmoud Bakhshi Moakhar called Air Pollution of Iran, 2004-2006, and a scale model of an ancient north African city called Ghardaia made from cooked couscous by the French-Algerian artist Kader Attia. Eight works have also been recently acquired from Latin America, such as Cuban Felix GonzalesTorres's Untitled (Double Portrait); six from the Asia-Pacific region, including Korean Do Ho Suh's Staircase III; and fourteen from South Africa, including Santu Mofokeng's The Black Photo Album/ Look At Me. Morris said: "The ambitious repositioning of Tate's collection is a response to the emergence of interesting and dynamic art centers across the world and an ever more complex and interconnected international art scene." She added that Tate wanted "to contribute towards a reshaping of art history reflecting local art histories across the world."